Located along the Central Pacific Coast of Mexico is the world class resort destination of Manzanillo. Surf, sand, and oceanfront views dominate this location. Perfect for a family vacation or a romantic getaway, Manzanillo is known for its authentic charm and wide variety of adventures. Fly into Playa de Oro International Airport (IATA: ZLO, ICAO: MMZO), Manzanillo’s official airport. Now that you have arrived, relax and unwind at the ultimate beachfront destination. Visitors to Manzanillo beach can partake in a wide variety of activities. These include swimming, snorkeling, windsurfing, and numerous other watersports. Known as the “Sailfish Capital of the World,” test your fisherman skills while trying to catch a sailfish or marlin. In addition to fishing, I would recommend a visit to Cuyutlan located only an hour southeast of Manzanillo. While here enjoy the spectacular ocean views and famous black sand beaches. Voted as one of the best places to surf in Mexico, grab your board and learn to ride the waves. Once out of the water, stroll along the “Malecon” otherwise known as an oceanfront promenade. Explore the shops, boutiques, and merchant stands to find the perfect souvenir to add to your collection. Walkways make the city easy to explore by foot. Jardin Alvaro Obregon is the main plaza where you will find live music and entertainment. It is also home to a number of bars and restaurants where you can sample the authentic Mexican cuisine. With so many exciting things to do and see you will have the time of your life. Manzanillo has something to offer for everyone, so be sure to add it to your list of future destinations. When you are ready to book your next charter trip, please contact us at 760-399-1000 or charter@desertjet.com, where a charter specialist will be glad to arrange your travel accommodations. 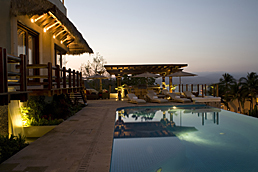 We can also arrange for your stay at the exclusive Casa Colina, perched high above the charming seaside village of Isla Navidad, a few minutes north from Manzanillo’s Airport.